Learn the Total wrist fusion for Volkmann’s ischaemic contracture (Using Synthes fusion plate) surgical technique with step by step instructions on OrthOracle. Our e-learning platform contains high resolution images and a certified CME of the Total wrist fusion for Volkmann’s ischaemic contracture (Using Synthes fusion plate) surgical procedure. 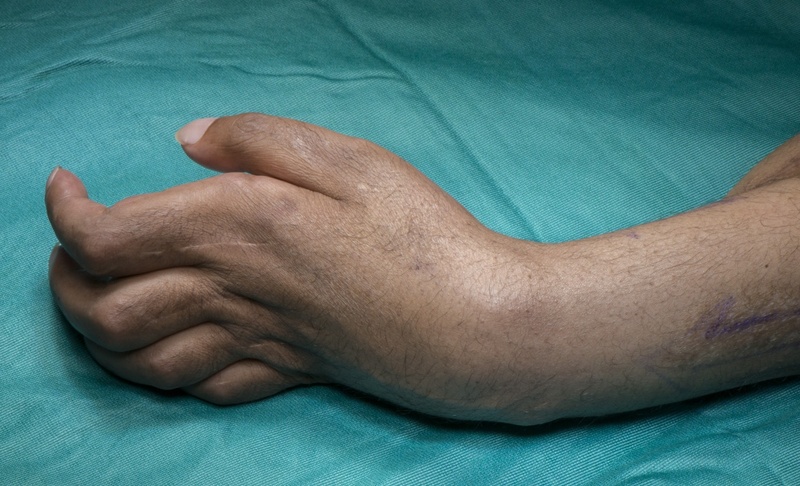 Volkmann’s ischemic contracture is a complication of compartment syndrome of the forearm. Untreated compartment syndrome results in degeneration of the forearm muscles and nerves resulting in contractures. It is classified by Holden into Type I and II. In Type the pathology is proximal to the forearm such as a vascular occlusion or injury. Type I can be mild, moderate or severe. In the mild type, there is involvement of the deep muscle compartment mainly FDPs to middle and ring fingers. There may be partial involvement of FPL and pronator teres muscles and median nerve. The moderate type is called the classic type. In this there is involvement of the FDPs, FPL and pronator teres. Median nerve is involved and there may be partial involvement of the ulnar nerve. The hand is in an ‘intrinsic minus’ posture. In the severe type all flexors and pronators are involved with partial or total involvement of the extensors and instrinsics. Median and ulnar nerves are involved. The hand is in an intrinsic minus posture. Median and ulnar nerves are involved. Soft tissue coverage may be tight. In Type II the muscle injury is limited to the site of direct trauma. The extent of muscle injury is usually limited to the forearm compartment. There may be damage to the nerves and loss of soft tissue. The extent of the finger deformity is related to the degree of muscle injury. Corrective surgery for Volkmann’s ischaemic contracture is dependent on the type of contracture and degree of involvement of various muscle compartments. The case discussed here is a Holden Type I severe type from a vascular occlusion in the upper arm. He presented with an acute compartment syndrome which was released but unfortunately it was delayed and there was already muscle necrosis. He presented with a fixed flexion deformity of the wrist, hypertension at MCP joints of the fingers and flexion at interphalangeal joints. An MCP joint release using dorsal capsulotomy was done initially and a flexor muscle slide was attempted later. Unfortunately both these operations were unsuccessful. This operation is aimed at correcting the wrist deformity through a total wrist fusion and a later tendon transfer to move the ECRL to FDPs of the fingers. He may also need a fusion of the thumb CMC joint in an anatomical position and a transfer of EIP to FPL. The steps of a total wrist fusion is explained through this operation. When performing a total wrist fusion, the radio-carpal joint, capito-lunate joint and third CMC joint are fused. In this case the joints between capitate and hamate and between triquetrum and hamate are also included in the fusion to increase the strength. The distal radio-ulnar joint is left intact which usefully preserves pronation & supination.